The most enchanting place in Lhasa may be the Jokhur Temple, but the place that best embodies the image of Tibet, the peaceful Buddhist kingdom on the top of the world, is the Potala Palace. 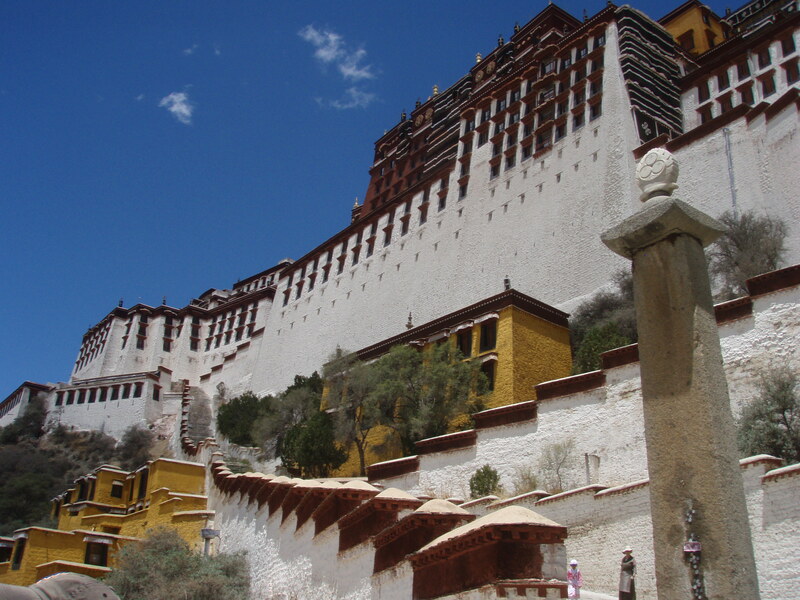 The enormous white and red palace sits atop the Red Hill like a crown smiling benevolently over all of Tibet below. It is at once such an impressive man-made construction yet so harmonious with the surrounding natural environment that it made me think it was constructed magically with a snap of the Dalai Lama’s holy fingers. Its ramparts rise abruptly from the hillside and continue skyward for perhaps 200 feet before your eye meets the first of thirteen stories of windows. The palace is accessed by a pair of staircases that cross the front of the palace like the steepest mountains switchbacks. Its thousand-plus rooms are tucked into the uppermost levels of the palace and are connected by narrow passageways and filled with altars, mediation rooms and the golden tombs of the past Dalai Lamas. Narrow archer’s slits are sliced into these walls, and from the distance the palace looks like a castle, at once welcoming and formidable, but above all it looks unassailable. But its walls were stormed by Mao’s People’s Liberation Army and now the Dalai Lama’s throne is no longer a seat of power but a museum attraction, a thing of the past. Chinese tour guides lead their groups through the sacred halls and point to where the Dalai Lama used to live, where he used to pray, where he used to reign. Each tourist’s visit further cements the defeat of Tibet. The palace is ornately decorated. The Dalai Lama’s tombs are made from thousands of kilos of gold and bejeweled altars are in no short supply. The Chinese claim that the monasteries were getting rich off of the laboring serfs before the “liberation.” It is certainly true that the Dalai Lamas were not living the most austere life possible. I might have agreed with this Chinese claim, but I could not agree with much else. I could not agree with the invasion, I could not agree with the subsequent destruction of temples, I could not agree with the soldiers on the streets and I could not agree with the ousting of the Dalai Lama and the conversion of his palace into a museum. The more I have learned about Mao and his destructive reign, the more respect I lose for his successors in the Communist Part. To be sure, they are not Mao and most of Mao’s radical policies have been reversed. But are the new policies that much better than Mao’s? They might not be dynamiting temples, but they are eroding Tibetan culture and turning Lhasa into a Buddhist-Themed Disneyland. I get angry with each entrance fee I have to pay because I know the money is going to the government, not to the Tibetans. The only place in Lhasa with no entrance fee is the brand-new Tibetan Museum – though not everyone can enter. A sign outside specifically prohibits disheveled, dirty people from entering. I assume this refers to Tibetan pilgrims. There is a reason the museum is free: it is difficult for any government to charge people for thinly veiled propaganda. Every aspect of Tibetan culture – from history, to religion, to art – was linked to Chinese civilization, the overall message being that Tibet had “absorbed the essence of Han culture” over the centuries and therefore justified the current occupation. There were plenty of Chinese tourists reading these displays, seemingly unaware of the political blinders placed over their eyes. There were few foreigners and no Tibetans. I left quickly. The museum was attached to a state-owned souvenir shop that sold virtually every Tibetan handicraft. Many wealthy tourists from China’s large cities perused the goods, much like in the touristic areas of the Yunnan province. I feel as if many urban Chinese visit these minority provinces to collect cultural artifacts that are unavailable in their ultra-modern mega-cities, as if Modern China has lost touch with Ancient China and is looking at other cultures for compensation. I bought a few trinkets. Maybe the West is doing the same thing. The last place I visited was the Rene Monastery, formerly home to 7,000 monks and widely known for its famous “debating garden.” The government just released a number of monks who had been imprisoned since the March 2008 uprisings. Now there are a whole 100 monks! I entered the debating garden and joined the other foreigners who ringed the courtyard and gawked at the red-robed monks sitting in circles and debating the finer points of Buddhist philosophy. Tourists nearly outnumbered monks. Most tourists watched in silence and took pictures. The monks sat in the shade in groups of six and one monk stood above the rest and hurled sharply worded questions at his peers. With each question he leaned down and slapped his hands together emphatically inches away from his opponent’s face. The other monks watched with ooooohh’s and ahhhhh’s as the debates flowed back and forth for hours. One debate was particularly lively. I asked Ferguson to translate. The debate concerned permanence, an important concept in Tibetan Buddhism. If, as the Buddhists believe, everything is impermanent and nothing is permanent, how can anything exist? The debate continued for another half hour, but as I watched the monks debating in this once-great, once-ransacked, now-touristic shell of a monastery, another debate sparked in my own mind. Everything may be impermanent, but the Chinese look like they are here to stay – so how much longer can pure Tibetan culture really exist?